Spring Skiing is here on a strong base! Let's make a deal for rest of season!!! we can make a special deal which VRBO will approve of on my say so, sooo....? 7 day Sat to Sat bookings are preferred by myself and are the best deal for most guests! Early season booking allows wheelin' and dealin' discounts and, occasionally, shorter term stays. Check availability calendar and book early! 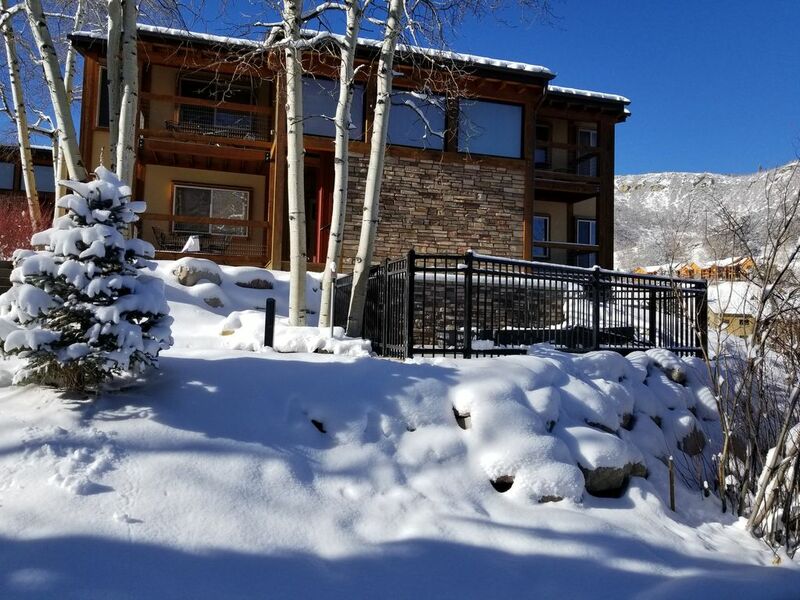 Our recent extensive exterior remodel & landscaping creates an easy 2 min.on heated sidewalks to the New Base Village Lifts, Treehouse Ski School and restaurants and shops. Also free private parking just below the condo and easy shuttle access throughout the Village and Aspen and Buttermilk etc. Everyone is charmed by this tasteful and well thought-out remodel with designer touches throughout: the antiqued cabinets of the full-sized kitchen, the log-frame Queen bed, an art glass wall, faux-finishes on rough plaster, natural pine trim and rusty slate floors in the surprisingly spacious wardrobe, vanity and laundry areas.Think flannel sheets and down comforters. Resting at the rustic pine dining table, warmed by the heat of the sweet pinion wood in the fireplace, you can see down through the tree tops to the stone footbridge: an invitation to glide past the new private hot tub/spa to the mountain's central quad chair which accesses the Village's restaurants and shops and beyond, miles of widely varied terrain. Nice place, David is great. Nice functional place, close to the slopes. Close to slope, conveniently in middle of town. David is a fantastic host who replay takes good care of you. The apartment is small for 4 people but possible. Everything works great including the fire place or bbq. Thanks David! We enjoyed our stay and had an excellent skiing week. The location is very convenient; close to the slopes and lifts as well as The Mall, restaurants, grocery store and bus station. We did not have car and managed to get everywhere we needed to go. The condo and the kitchen are well equipped with everything you need or you do not know you need. An example is the humidifier which we appreciated so much. David is an excellent host. He was very kind and helpful with info and advise. We are very thankful that he came to pick us up from the airport and also sacrificed half daily of skiing to drop us off to the airport. We had so much luggage with the skis and everything, so it meant a lot. By coincidence we bumped into David at the Elk Camp Lodge and had the pleasure to ski together couple of runs. We would stay there again and would recommend the place. This is a fantastic property - cozy, cutely decorated, comfortable and David is an excellent host. The pictures do not do it justice. It is perfect for a couple or a family with one or two kids. If our son, 22yrs old, had been with us, he would have been quite happy sleeping on the foldout sofa in the living room. The property is small but it has plenty of storage and everything needed for comfort. The kitchen is well equipped and the humidifier was greatly appreciated. The condo is located right next door to the Stonebridge Inn which has an excellent restaurant and happy hour which we loved on lazy evenings when we didn't want to shuttle anywhere. This condo is extremely close to being a ski in- ski out property. It really is only a 2 minute walk to the snow where you can ski down to the lift. The best part is that it is a 2 minute walk - downhill - both ways! In the morning walk to the snow on the near side of the Stonebridge Inn and on the way home ski to above the Stonebridge Inn and walk home -downhill all the way. It is easy to return to the condo for lunch and a mid day rest if so desired. Both the village shuttle and the 4 mountain RFTA buses stop right outside of the Stonebridge Inn also, so transportation is extremely convenient. We will definitely stay here again when we return to Aspen. Thank you, David, for making our stay so enjoyable! A great condo, perfect for a couple. I stayed almost 3 weeks, and appreciated the very short walk to the slopes and base village. The condo is nicely remodeled, with a wood burning fireplace (wood supplied!) and everything else you would need. Best part is a very nice and attentive owner ready to make your stay perfect. I will return. Only really big enough for 2 people, and the bedroom is very small. But if you are a couple and want cozy time together its fine. Can't beat the price for the location, walk 100 yards to the lift. The owner is very pleasant and helpful with any need or request we had. When back in Snowmass will stay here again. Only big enough for four people if you are two Aussie couples or couple with 2 young kids. So say their reviews anyway. I always say "very cozy" for 4 but, every season, for a couple of renters, it isn't a problem. I don't know how they do it. Like you two, I would say "too cozy"! Anyway, I enjoyed your enthusiasm and your careful planning etc..
You, indeed, are welcome back anytime.